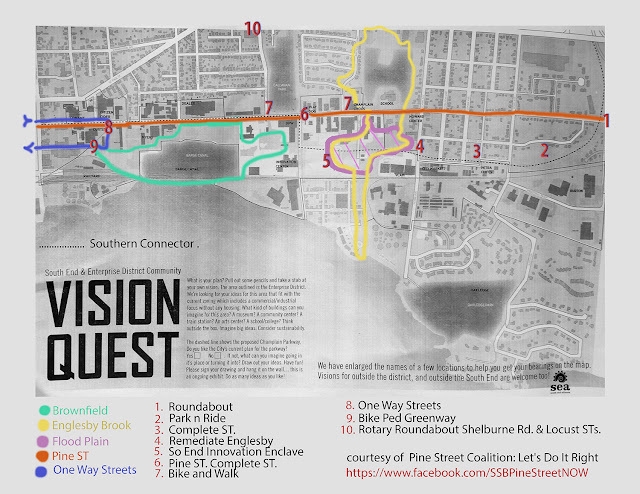 Pine Street Coalition forms to Re-design Champlain Parkway Following a February public event a new group, the Pine Streets Coalition (PSC), aiming at re-designing the Champlain Parkway to meet the needs of the South End and the City. 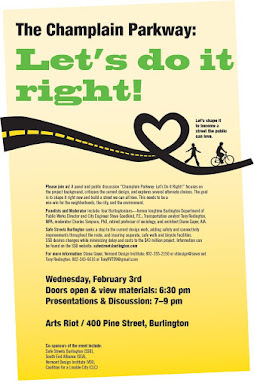 The Pine Street Coalition naturally grew out of Safe Streets Burlington (SSB) which undertook the first tasks to identify the defects in the current Parkway design, looked into alternatives, and organized a major February event, “Let's Do It Right,” where for the first time since 2006 a full exploration the issues with the Parkway and open ended public discussion took place. Both PSC and SSB developed Parkway re-design guidelines and PSC has prepared maps outlining the changes in design which makes the Parkway and Pine Street $43 million investment responsive to roadway and neighborhood practice today, distinct from the dominant freeway thinking of the 1950s encapsulated in the current Parkway design. 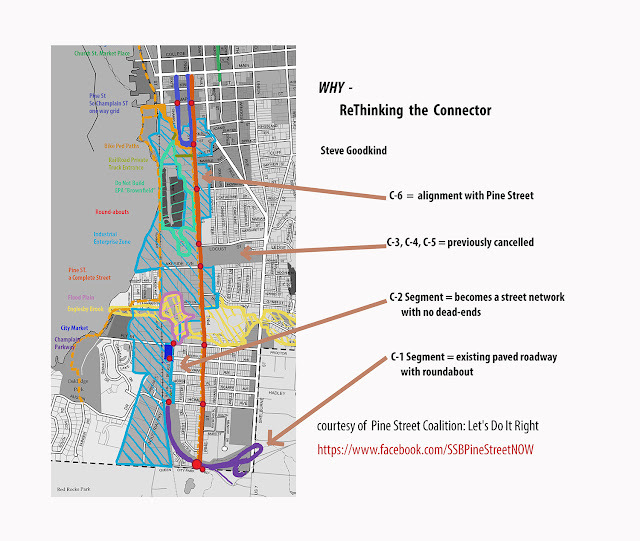 That freeway thinking remained completing a freeway ring road around the City which practically erased the the waterfront area an divided the Old North End in two. First and foremost design approaches today stress safety for those who walk, bike, and travel by car. Both PSC and SSB stress the current Parkway design results in higher injury rates. Instead of creating the barricades to access contained in the current Parkway design, the PSC calls for maintaining and expanding connectivity throughout the Parkway and Pine Streets corridors. The PSC takes savings from the Parkway re-design and invests in upgrading the lower part of Pine Street south of Lakeside Avenue into a complete street. The Pine Street Coalition will continue their educational and community contact efforts going forward and seek new resident members and partners from businesses and others throughout the South End and the City with concerns and connections to the effects of bringing new thinking and design to the Parkway project. Presenters at that February event and members of the newly formed PSC include long time Burlington Public Works Department director Steve Goodkind, Diane Gayer of the Vermont Design Institute, retired professor and Neighborhood Planning Assembly Steering Committee member Charles Simpson, and safe streets and roundabout advocate Tony Redington.